I thought I'd share another project made with the Lizzie Anne designs Jolies' Fleurs Stamp set. I used this as a prettier way to give money as a gift. I just accordion folded the dollars in the center and wired it to a wooden skewer (they looked better fresh). I punched green scalloped circles and glued the skewers to the centers. I stamped the big flower, colored it with Copics and added Stickles to the center. Then I circle punched it and mounted it with foam tape over the skewer. Then I stuck them in some floral foam in a flower pot. If you were more ambitious, you could paint or ink the skewers green and add a ribbon to the pot. Oh, and if anyone is still looking for the new cuttlebug embossing folders - I have one each of Swiss Dots and Floral Fantasy left in the store. I've ordered more and they should be here next week. 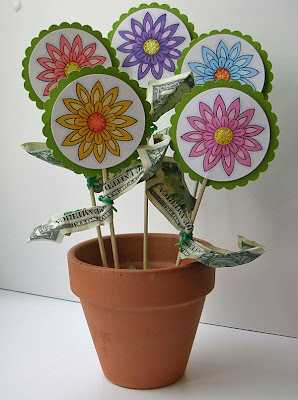 what a great way to give money, those flowers are beautiful. Hey what a cute pot of flowers!! The leaves probably got messed up when I tried to snitch them!! haha! !